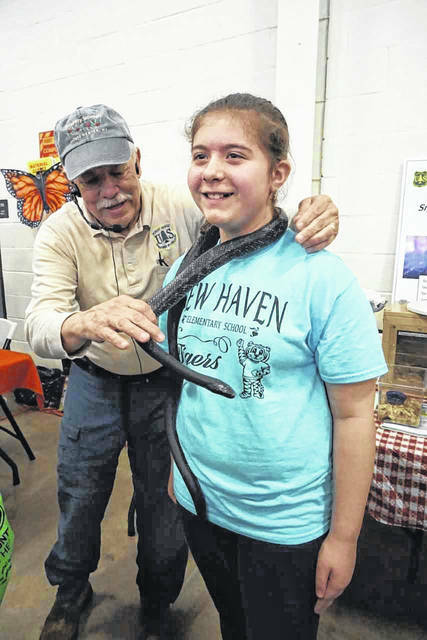 The “Snakes of West Virginia” exhibit by Roy Moose was a popular booth at last year’s Mason County Outdoor Youth Expo. Those students who were brave enough were treated to a snake necklace for a short time. POINT PLEASANT — Around a thousand elementary students will converge at the National Guard Armory over a two day period next week for the annual Mason County Outdoor Youth Expo. The event will be held Tuesday and Wednesday from 9 a.m. to 2:30 p.m. In addition to the students, parents are invited to attend, as well. The goal of the expo, according to organizers, is to encourage youth participation in positive recreational activities; promote family bonding; enhance school, community and family collaboration; promote anti-drug and anti-violence attitudes; and provide positive role models for youth. Various groups and organizations are scheduled to have exhibits and booths at the event, which the children can visit following the main program. Door prizes will be given away, many of which promote outdoor activities such as jump ropes, fishing poles, balls, and camping items. Doug Wood of Hurricane, WV will be speaking to the students on “Enjoying West Virginia Outdoors.” A member of the West Virginia Scenic Trails Association since 1975, he serves on the board of directors of the Kanawha State Forest Foundation, as well as being a member of many other outdoor organizations. Wood will be giving an overview of outdoor activities throughout the state, including hiking, canoeing, and backpacking. He said his goal is to interest the youth in getting outdoors and exercising. “Bicycle Safety” will also be a topic of the expo program, presented by Gabe Roush. An Athletic Trainer and Manager of Sports Medicine at Pleasant Valley Hospital, Roush is a part of the BikePoint organization and a member of the Point Pleasant City Council. He will be covering basic bike safety, including proper equipment, maintenance, road rules and etiquette. Amy Mullins, Director of Rehabilitation at Pleasant Valley Hospital, will conclude the expo program. She will be leading the students in a number of wellness activities. Each of the county’s elementary schools will be busing students to the event. Children from New Haven Elementary will attend Tuesday morning; Point Pleasant Intermediate on Tuesday afternoon; Ashton and Leon elementary schools on Wednesday morning; and Roosevelt and Beale schools on Wednesday afternoon.